Modem router is commonly used to set up home network with DSL or Cable broadband Internet but without the need of having stand alone modem. That means if you have modem router, you don’t have to purchase separate DSL or cable modem for connecting to Internet. Usually it’s wireless or wired router that comes with built-in modem feature, so you could connect one end of the phone cable to the DSL or cable port on the back of modem router, and then connect the other end of phone cable to the wall jack with DSL or cable service. Finally connect the modem router’s LAN port to your computer or laptop with proper IP address, subnet mask and gateway in order to configure it correctly. Advise you to always read the user manual in order to understand more. Is it difficult to configure modem router? No, it’s pretty easy to configure it if you have configured wireless or wired router before because the configurations are almost the same. 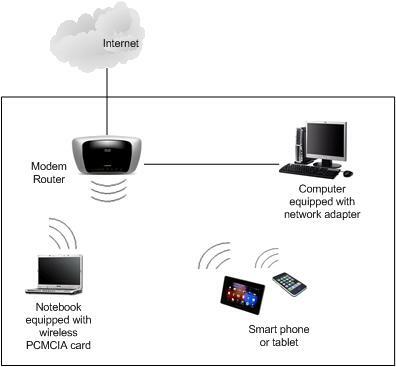 Let’s use wireless modem router as an example, other than configuring typical Internet settings (for connecting to Internet), LAN settings (configure IP address for the modem router), wireless network and wireless security settings, the additional settings you need to configure is related to modem specific settings which default settings might work fine on your network most of the time. If you want you could take a look on this wireless router configuration article to understand more on how to configure wireless router. Return to top of "The Usage of Modem Router"! !